The Hispanic Association of Colleges and Universities (HACU) and Excelencia in Education (Excelencia) have announced the 2015-16 academic year saw continued and concentrated growth in the number of Latinos attending college. As a result, there is an increase in the number of Hispanic-Serving Institutions (HSIs) in the United States. In general, HSIs have 25% or more Latino enrollment. In 2015-16, 14% of all institutions of higher education (472 HSIs) enrolled 64% of all Latino undergraduates. Additionally, the number of Emerging HSIs, or colleges approaching the 25 percent Latino student enrollment threshold, also shows an upward trajectory from 310 to 323. While these numbers are promising at first glance, the success of Latino students at these schools continues to be a challenge. Excelencia and HACU are implementing programs and conducting the research to inform ways to improve the success of these students. 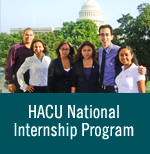 • HSIs enroll nearly two-thirds of all Latino undergraduates. • When you put together the student population at all HSIs, 46 percent of students are Latino. • Many HSIs have relatively low enrollment, with 59 percent of HSIs enrolling 2,000 or less total full-time students. • 44 percent of HSIs were community colleges, and 66 percent were public institutions. • A majority of HSIs are located in urban areas and are concentrated geographically, with 81 percent of these institutions in California, Texas, Puerto Rico, Florida, New York, and New Mexico. • HSIs and Emerging HSIs are present in all but 13 states, including those less known for their Latino population, such as Indiana, Kansas, and Tennessee. “The continuing growth in the number of HSIs is a positive sign of progress in educational opportunity and achievement for Hispanics, who account for almost three quarters of the growth in the U.S. workforce in this decade. Hispanic educational success is vital to America’s future prosperity and security,” said John Moder, Senior Vice President and Chief Operating Officer at HACU. To download the joint release by HACU and Excelencia, click here. For a PDF version of the Fact Sheet and HSI Map, please click here.